I believe that if I have done anything right in this burgeoning academic life it is that I have taken the development of my network seriously. I cultivate it daily. I add to it or ‘prune’ it whenever possible. I am consciously aware of signal to noise ratios. But most importantly, I recognize it is a collection of people. All colleagues, many friends, and some both. I work with them often, across fields, across time zones, organizations, etc. I co-author quite a bit as I find it to be the most rewarding form of academic authorship (I would argue the most relevant as well, but will save that for another post). It is an understatement to say that I rely on my network. Two of the greatest fixtures of that network are two Finnish colleagues, Pekka Ihanainen and Irmeli Aro. Pekka and I work together and co-author quite regularly on all things related to mobile learning, our ideas of the need for a pedagogy that accounts for the simultaneity of learning activities, and our love of field activity and lifelong learning. Irmeli and I met at a workshop in Helsinki (organized by Pekka) and have followed her work with interest. She is an incredibly creative, intelligent individual, one from whom I have taken much inspiration. All that being said, it is no surprise that I am drafting a few papers that drew on these relationships. I have written often about mobile learning and field activities, how using mobile technology in ‘the field’ can produce some interesting learning scenarios. Pekka and I have worked quite a bit on this as well as incorporating more ideas from lifelong learning into this mix. I am finding that these activities, not surprisingly require a fairly confident learner, one able to routinely make sense of a world perpetually visible to them (through recorded media or learning) and perpetually shifting. Some learning taking place consciously (what am I learning here? Why am I doing this? What are the takeaways from this activity? How could this be improved? ), and some being processed subconsciously. These subconscious learning processes are most interesting to me as they are unaccounted for in most pedagogy (as far as I can tell). Subconscious learning is a healthy process of pushing those initially difficult to answer questions to the back-burner to let them stew a bit, the answers coming when they are ready. The end result of these subconscious learning activities is often the eureka or epiphany of sudden realization. That electricity of suddenly getting it. But this process isn’t a divine insertion of an answer to a challenging question. It is the result of cycles of conscious and subconscious reflection. Consistent reflection helps make sense of all of this to the learner, either through a blog, diary, or scrapbook or subconsciously through dreams, etc. Visible reflection is a useful tool for these mobile learning field activities as there is an amazing amount of stimuli to wade through, amazing amounts of data being generated, and potential meaning to be made. How does one identify what is useful and what isn’t in such a scenario with limited instructional presence? Visually in one approach to do so. through visual representation we begin to articulate and decipher the undecipherable. Irmeli has a wonderful technique for doing so, one that she articulates better than I would ever be able to. She artistically visualizes a challenging learning environment through art. Through drawing. A deceptively simple response to an overwhelmingly complex scenario. It is the first step of articulation complexity, through representation. We can liken it to a process of observation and participation to analysis and synthesis. However, in this process, the synthesis is revisited several times over the course of the learning. First, we synthesize our evolving understanding through artistic representation (much as both Pekka and Irmeli do), then we use that representation as a mechanism for unlocking further understanding. The image helps us understand what we know and don’t know yet. Further iterations and representations further make sense of complexity. So in this model, the representation is very early in the process, more of an initial impression to complexity. This type of representation is also extremely well suited to mobile technology. The learner, amidst the learning taking place through the field activity, can represent their learning (a sort of micro-reflection) at various stages through collages, montages, panoramas, etc. through applications. They can record sounds, video as canvases; they can draw over top the recoded media, assemble it in meaningful ways, share it, and begin to make sense of complexity. It is a process that we should try to push to the surface as much as possible. We can help our learners approach this reflection systematically, a disciplined approach where they eventually learn to reflect more as a reflex than as a conscious though. Irmeli provides a wonderful illustration on how that can be done visually. I might make the case here that not only is media the easiest means of making sense of a mobile environment (via a field activity), it is the preferred one. The learner is recasting their visual reality into a more meaningful construct through these representations. They are taking information (visual or otherwise) and turning it into meaning. It is a flow of activity from sensed to perceived to represented to transformed. This is where the Rilke quote at the beginning of the post comes in. This process of learning should flow like a river, naturally. Moving from a perceived natural environment to a represented one is generally a mapping of modes to the same modes. We move from an experienced world of sound and sight to a represented world of sound and sight. Once we have represented the space, we can then begin to move into other modes, transforming the learning further. The process is enacted, at least as I see it, like the illustration below. We perceive our worlds and then, if particularly complex, we attempt to represent these worlds. 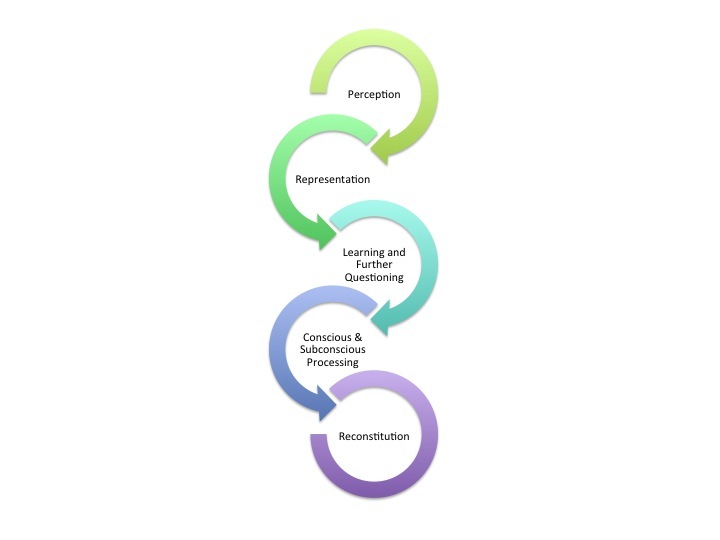 The representation is then used as a scaffold to further learning, either through further questioning or as a reflective tool for comparing what we know against what we previously thought. This further questioning can then split off into conscious or subconscious learning activity, depending on the complexity of the questions and our readiness to articulate and receive an answer. Once the questions are sufficiently addressed, we consciously perceive an answer (eureka) and then the subconscious and conscious processes are reconstituted. That all made sense in my mind. Perhaps less so in this post. Either way, Irmeli’s approach is a valuable addition to our learning repertoire, especially in learning environments like the ones I use in field activities. To see some of Irmeli’s work, take a look at her Flickr set on learning.